I know I’m late to the party, but I’ve been traveling and have several family affairs looming that need my attention. I started out in 2014 as a forum member and then in March I was a Global Moderator! 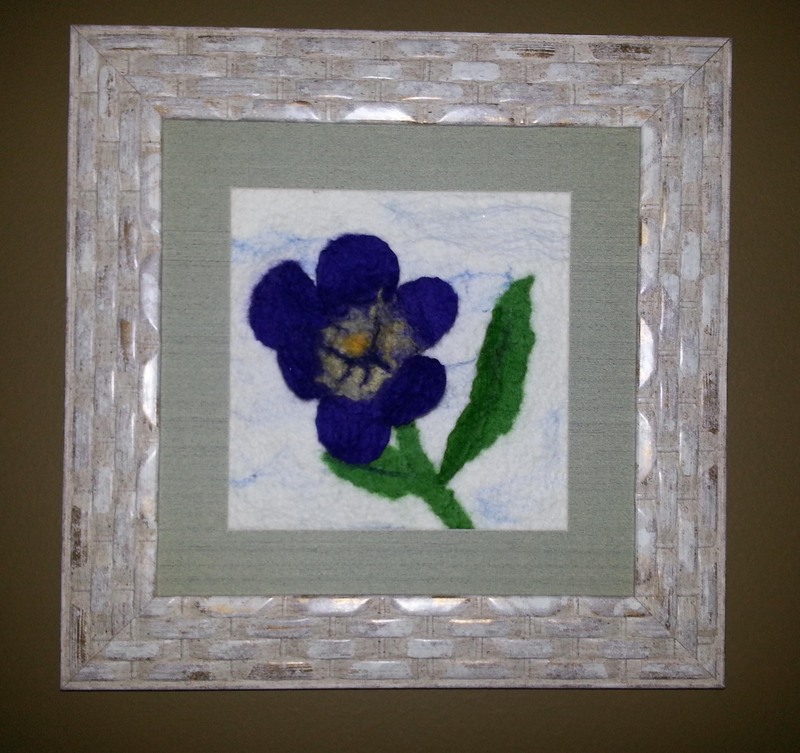 This past year has brought many challenges and delightful learning and wonderful outcomes in terms of felting. 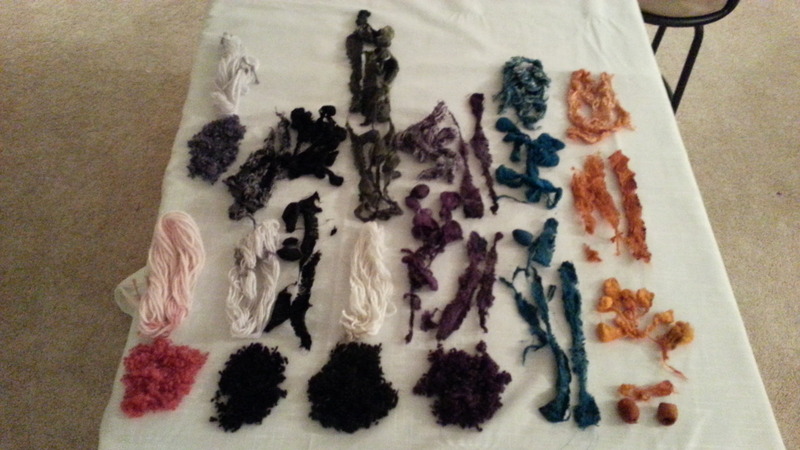 My year started with experiments in dyeing. 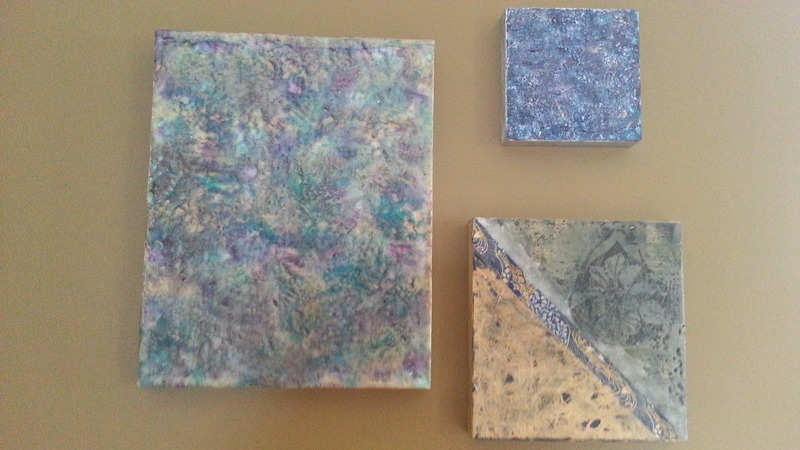 I shared my venture into encaustics. 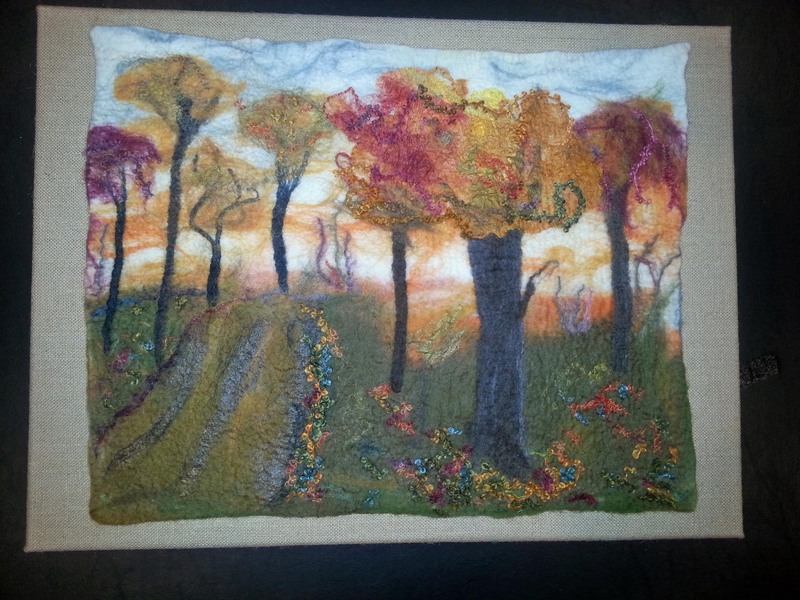 Tried my hand at painting with wool. Participated in the quarterly challenges. 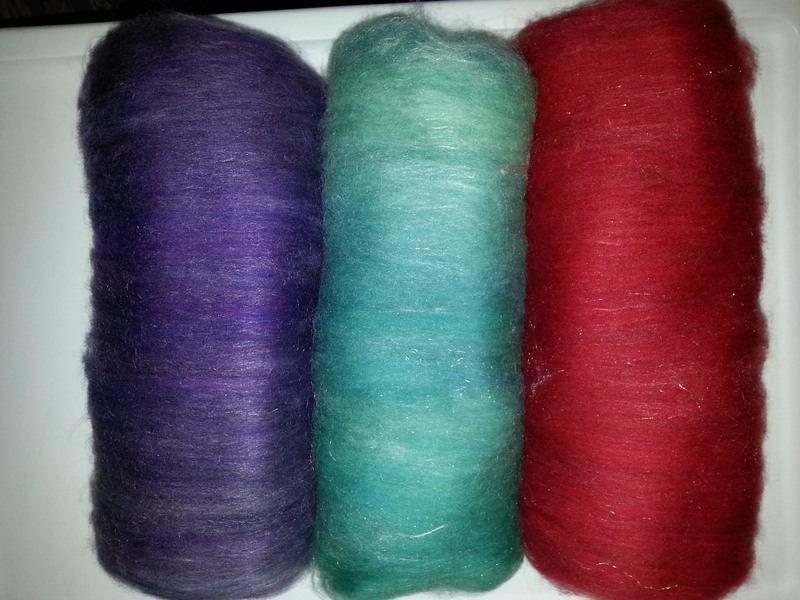 I broke down to drum carder envy and began my foray into making batts. Woo hoo! 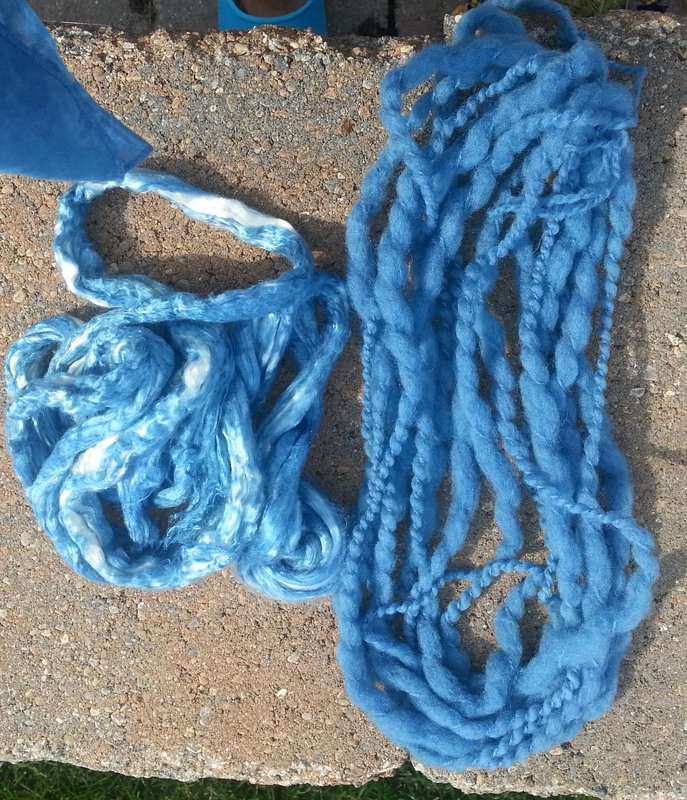 Cathy and I tried indigo dyeing. 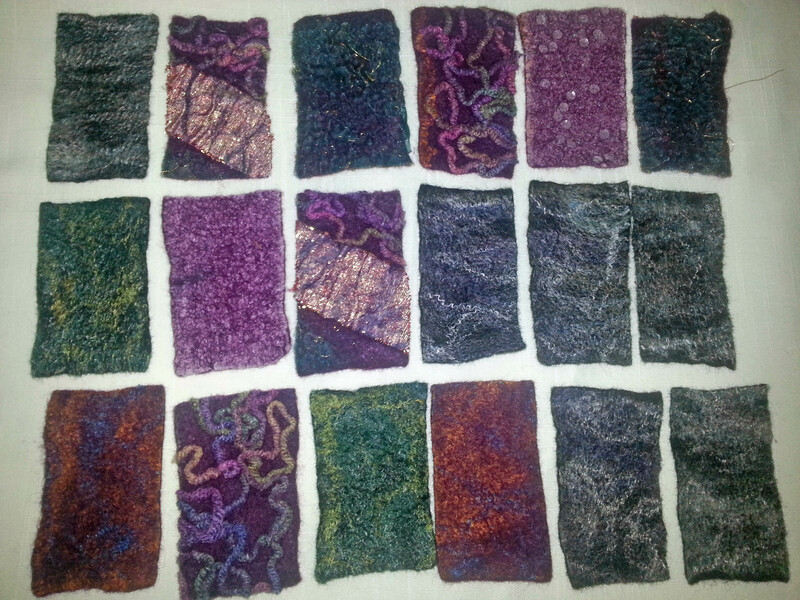 I know it’s been awhile, but its more fun felting than marketing… Sorry. 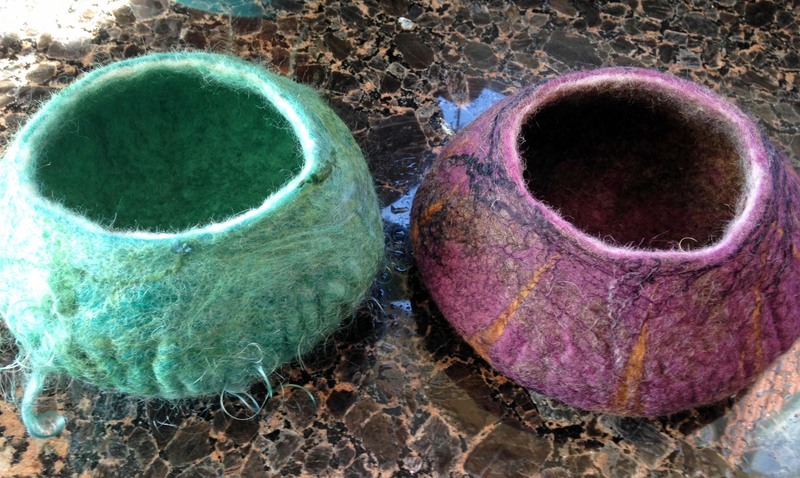 I taught a felting class. There was a period of obsession with pods and vessels. I ventured into free motion stitching. Then I experimented with embellishments and making a book cover. 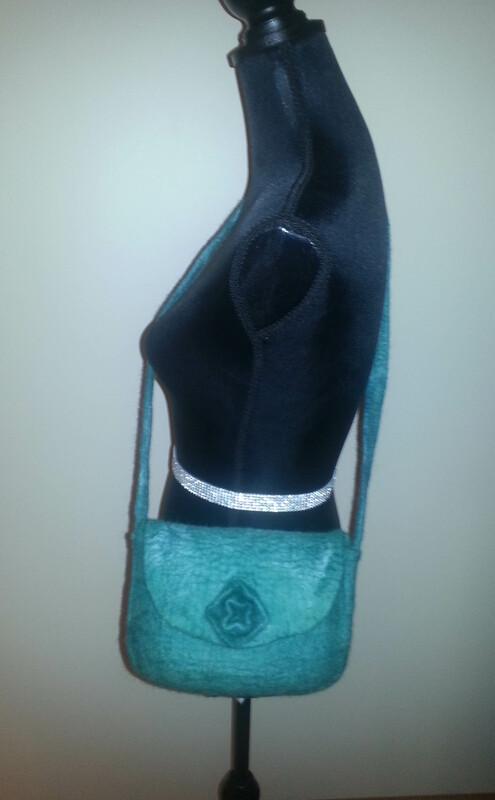 Designing and making a handbag was a huge accomplishment for me. 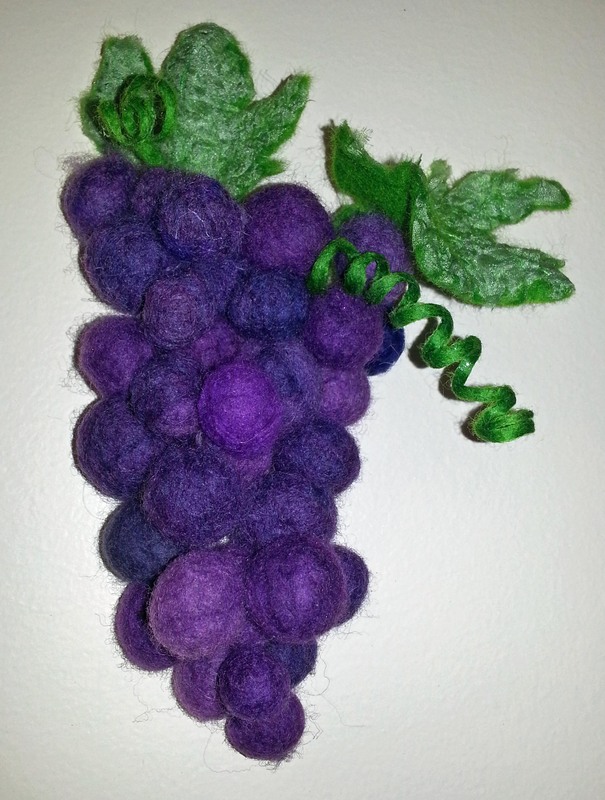 I experimented with 3D felting – grapes and flowers. I learned a lot of new techniques in Fiona Duthie’s class. 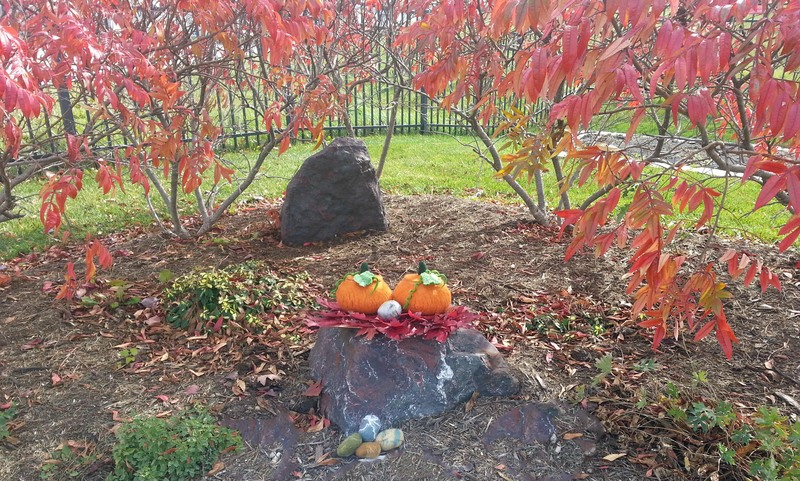 It was a busy year visiting farms, mills and fairs. 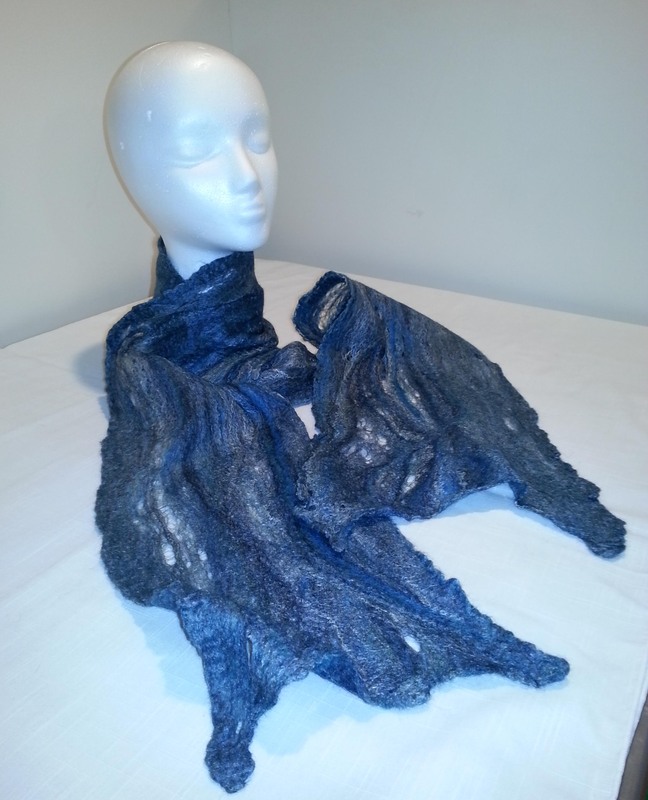 I made scarves including a cobweb scarf. 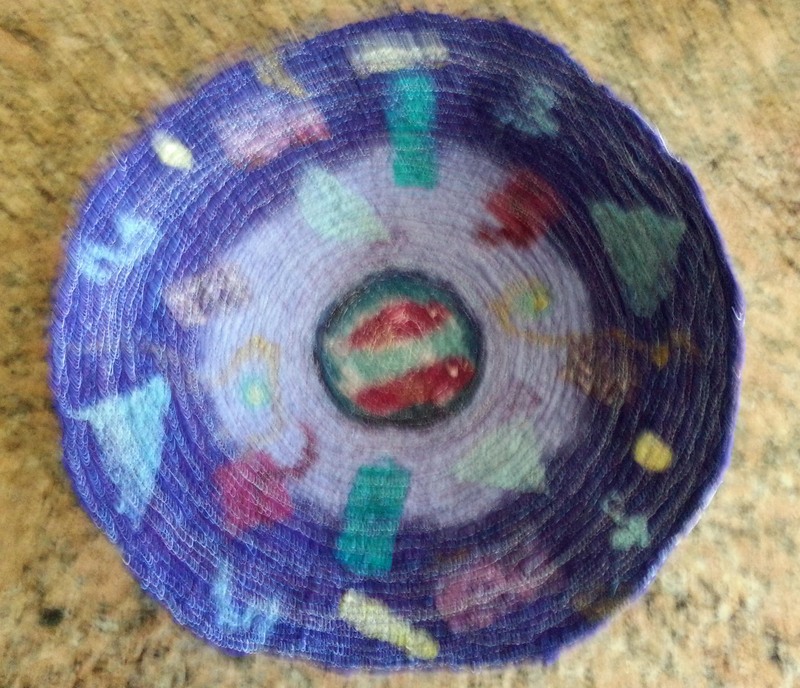 A big project was a 3D free motion stitched bowl, oh my! 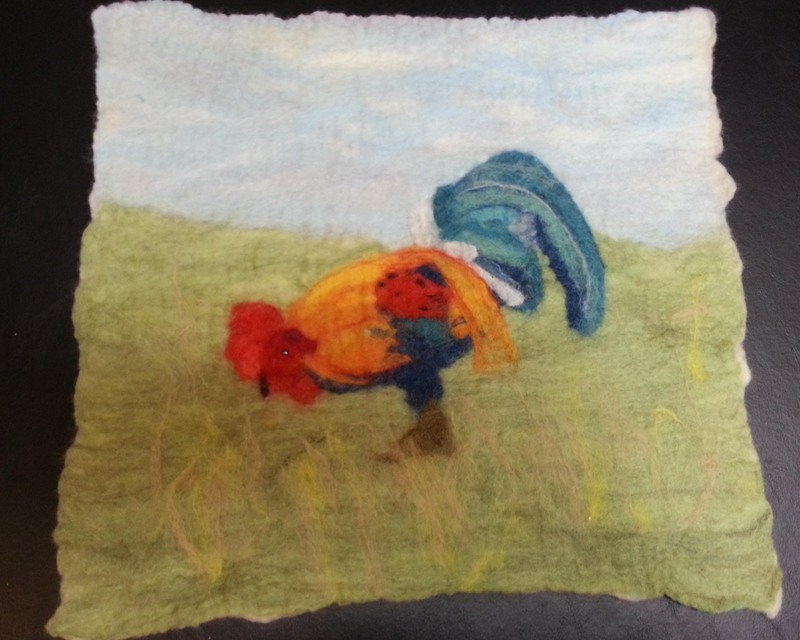 Felting a rooster, I learned to combine wet and needle felting. 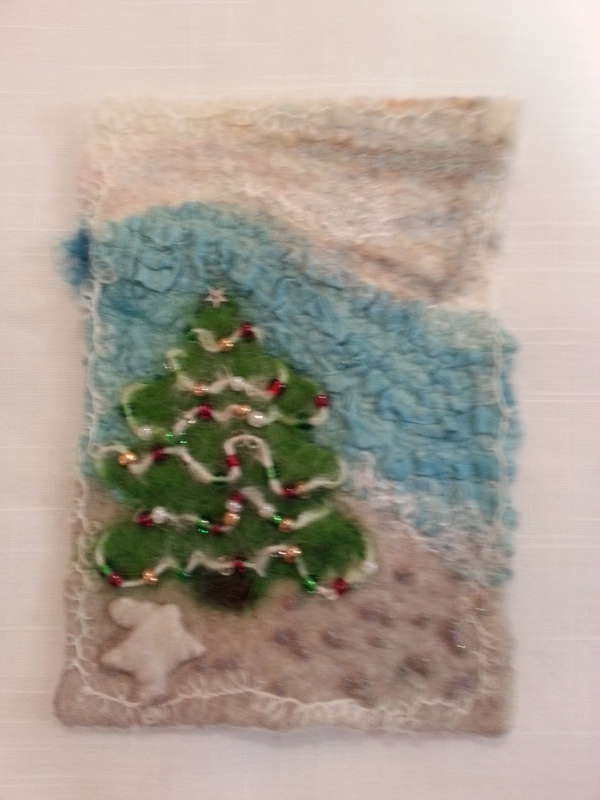 Our holiday exchange was an experiment of combining beading and felting. 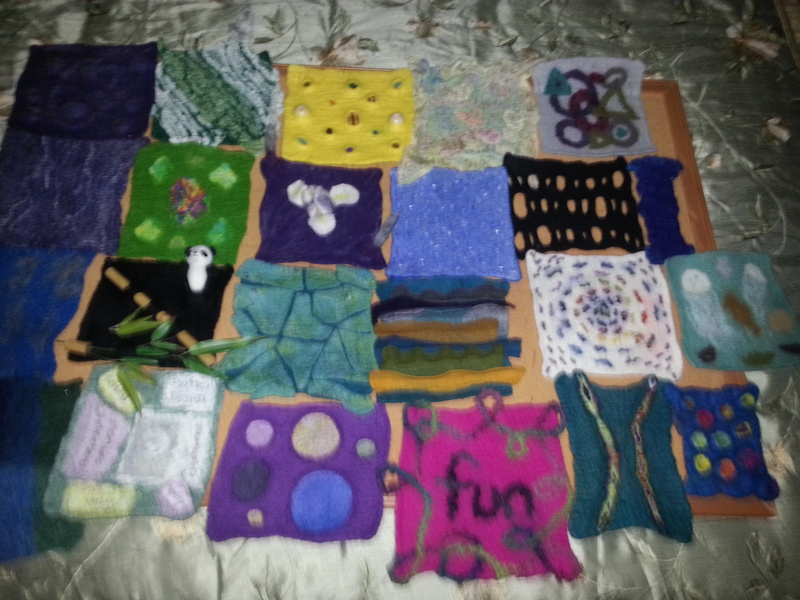 All in all, it’s been a very productive and inspiring year felting. Of course, there were many more projects that were completed. It has been a wonderful year. I want to thank all of you for teaching, inspiring me and encouraging me to do and try more. Thank you! A special thanks to my fellow moderators and Luvswool (Cathy), Leonor at Felt Buddies and Nada for pitching in and contributing to the blog. It’s been a terrific, fun journey. I can’t wait to see what 2015 brings and what I learn and try! This entry was posted in Year End Round Up and tagged 3 D, 3 D stitched bowl, Batts, Beading, book covers, business cards, challenges, cobweb, drum carder, dyeing, experiments, fairs, farms, felting classes, Fiona Duthie, framing, Free motion stitching, handbags, indigo, Marketing, mills, needle felting, pods, techniques, vessels, wet felting, wool, Year in review. Bookmark the permalink. You did all that in just one year? Stunning success! 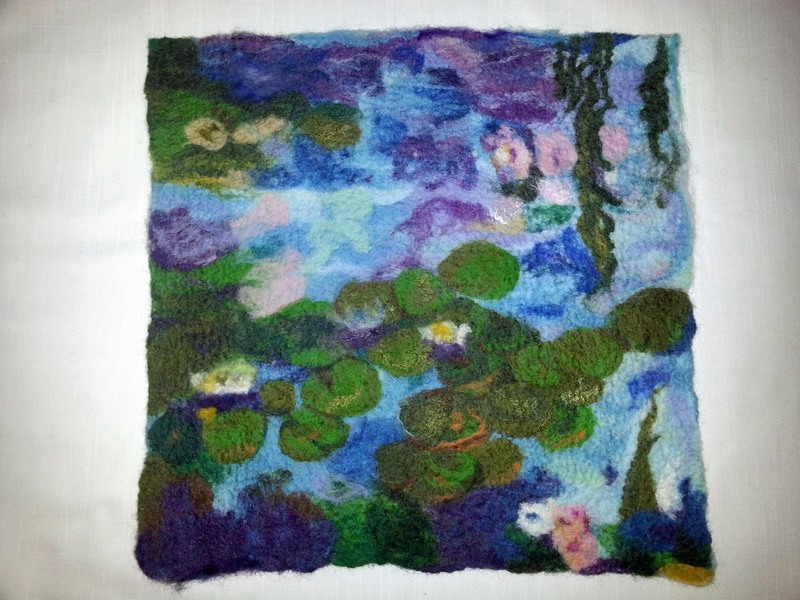 My favourite piece is the Monet – I love the colours and it would have a wonderful calming effect in a room. 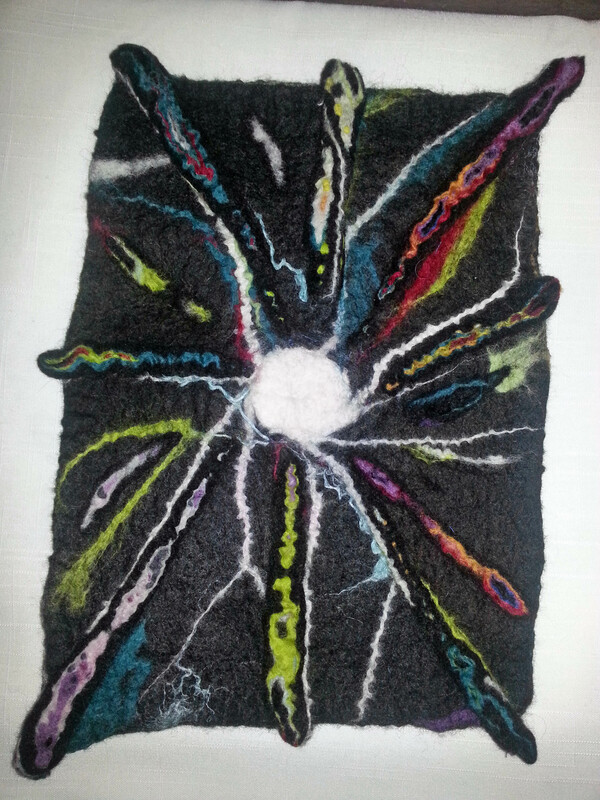 I have just started my felting journey, this later year and live the experimenting making flowers, soap, scarves, pillows, mittens, landscape , figures. Methods Wet, neddle, nuno , cobweb. Materials… learning, sharing, teaching and being taught….just loving it…. Thanks Dianne! Please join us on the forum and share your work. We love pictures and seeing what everyone is creating. It’s inspiring and we learn so much from each other. 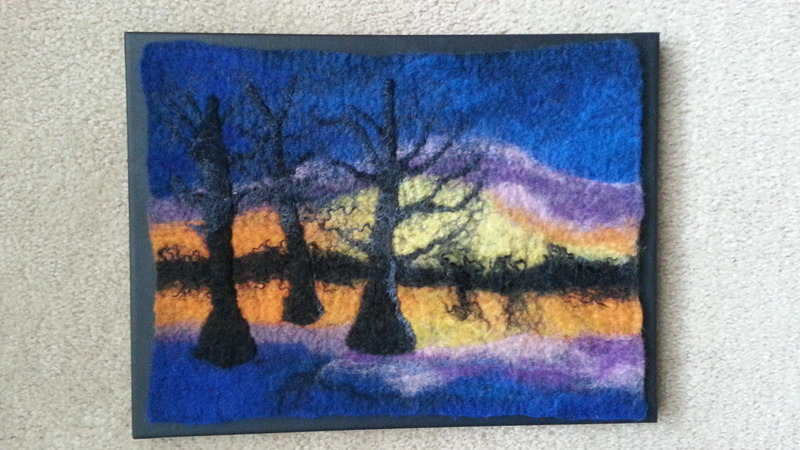 I’m so glad you’re enjoying your felting journey! Wow you have been busy this year. You have tried so many different things. Its great you found someone close that you can play share with. It is so much fun and so much more is learned when you felt together. Thanks Ann! It is great being able to felt with someone else. I’m lucky to have found Cathy and that we’re close enough to get together once a month or so. 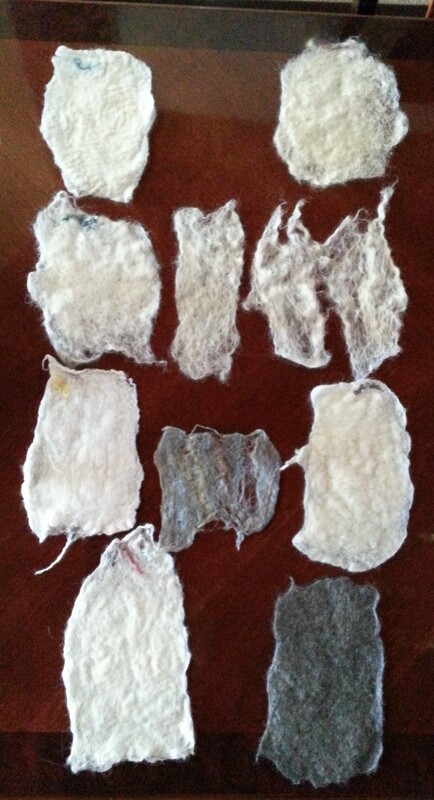 You have had quite a year of experimenting and felting and should feel very proud of all your accomplishments! 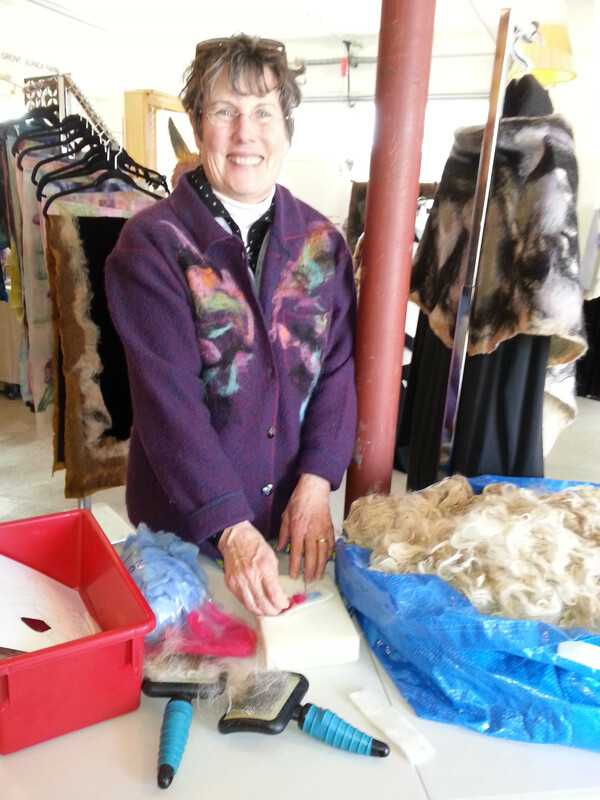 I was very pleased to have shared some of the felting fun with you and have great memories of our visits to the Midwest Fiber & Felting Fair and the Illinois Woolen Mill. 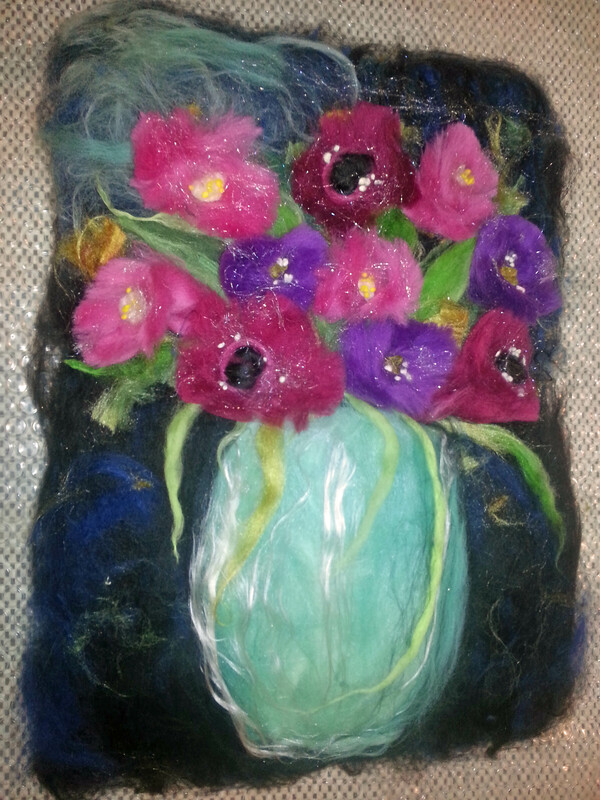 Looking forward to another great year of felting fun, experimentation and laughter! 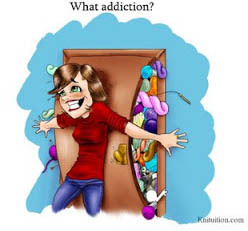 Hello Marilyn, you have a accomplished learning many things in the felting world this past year…everything you have made has been super wonderful.. That I do not thing I could even pick a favorite.. Smile… I was most impressed with your Batts… Smile. 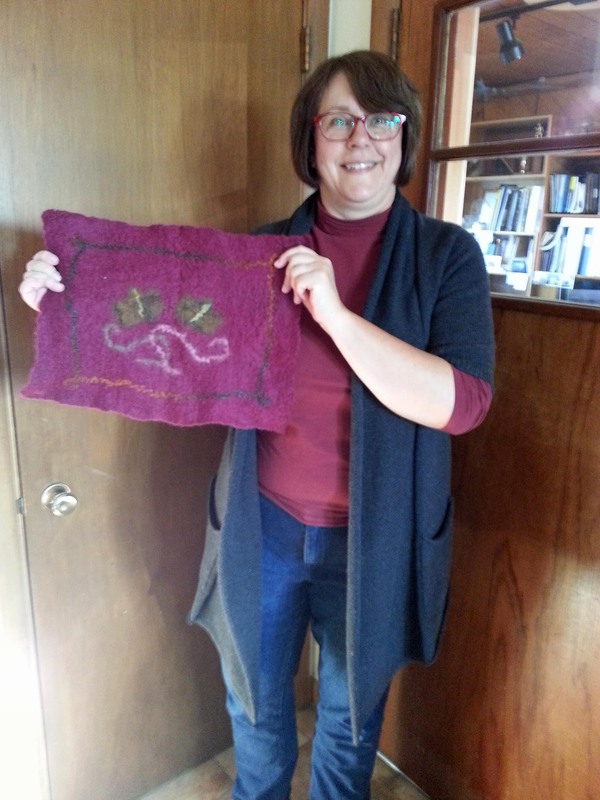 Thank you for sharing – my favorite is the rooster – wish I had someone living near me to share my felting with especially when I am challenged by something or trying to fix a mistake. Thanks Ruth! It’s been wonderful for me. Being part of the forum has kept me focused. I have so much more to learn! Mar, your year’s work is impressive! When did you get all that time? . 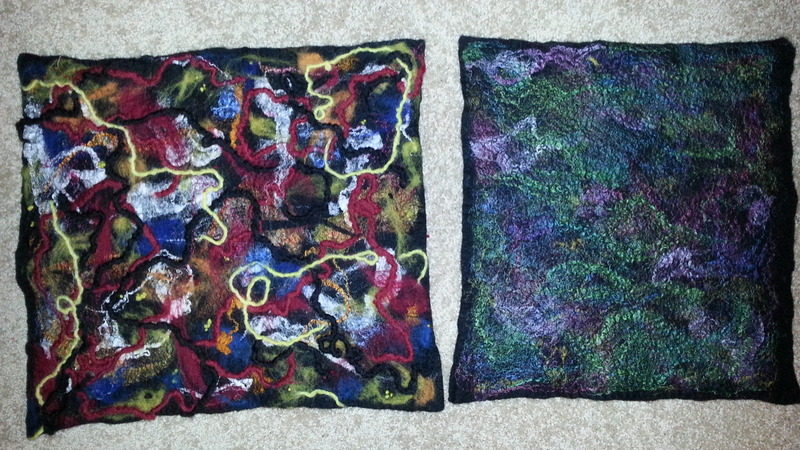 I especially liked your free motion stitching, but all of your works were lovely. Congrats on the accomplishment. Thanks Nancy! Remember I’m retired and I’m doing the things I love to do, just like your painting. I’m sure you’ve accomplished just as much. 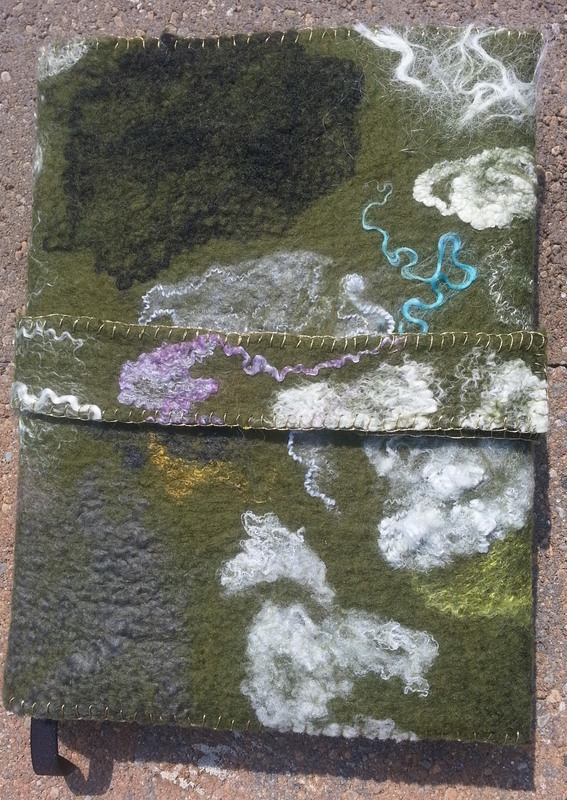 The free motion stitching is something I’d like to try more of, but there is still so much to learn in felting. I look forward to seeing more of your work in 2015. Thanks Judith! Grapes hold special memories for me. I second all of your likes! Marilyn,you’ve made a big step forward this last year. Very impressive. What is on your list for this year? I know a lot of people have already pointed this out, but oh my, you’ve been busy, Marilyn! Well done 😀 I love how you tried so many different techniques and just pushed yourself to go further. 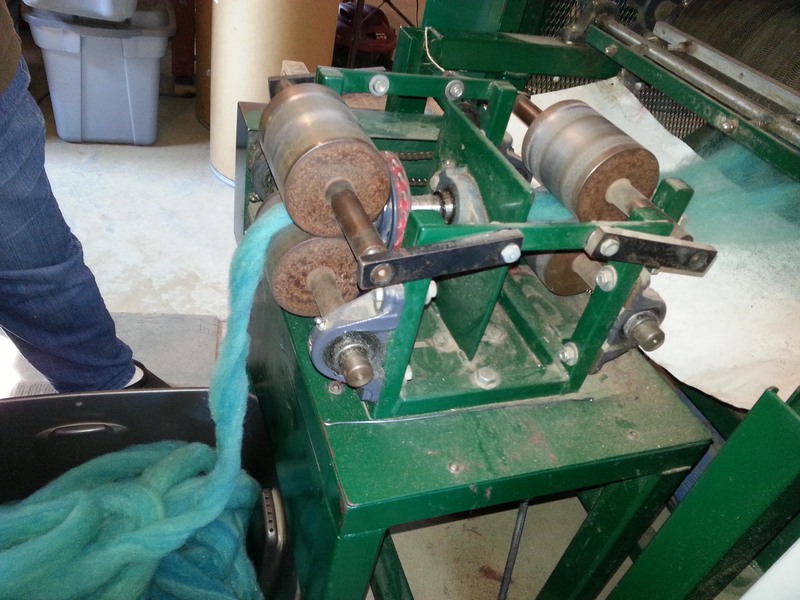 And… can I say I have vessel and mill envy now? I wish you a superb 2015, with even more crafting and discovering of new things!